More than three quarters of a century after its composition, Bartók's opera Duke Bluebeard's Castle (1911) is still categorized as "modern" music. Its status as a "contemporary" opera is largely due to the radical departure of its musical language from the basic premises of the traditional tonal system and is indicative of a more general revolutionary change in the language of art music that has remained an enigma for a large part of the musical public. The intention in this essay is to identify the sources of the opera's "modernistic" musical language and to show how that language is exploited by Bartók to reflect a new kind of dramatic symbolism that began to emerge in literature in the late nineteenth century. Bluebeard did not find public support in its early years, a condition which was largely due to the conservative tastes of the Hungarian public. It was originally rejected in a competition for a national opera in 1911 because its genuine Hungarian qualities were unrecognizable to an audience accustomed to hearing Italianate and Germanized settings of Hungarian texts. It finally had its premiere in Budapest on May 24, 1918. With the collapse of the postwar revolutionary regime in 1919, however, both Bluebeard and the second of Bartók's three stage works, The Wooden Prince ballet, were banned because of the political exile of their librettist, Béla Balázs, and Bluebeard was not performed again in Budapest until 1937. However, the reasons for its lack of acceptance appear to extend beyond these cultural and political attitudes surrounding the work, since it was not until June 10, 1974, that it was to have its premiere at the New York Metropolitan Opera (with Shirley Verrett and David Ward, conducted by Sixten Ehrling). Its next performance at the same institution did not occur until almost fifteen years later, on January 16, 1989 (with Jessye Norman and Samuel Ramey, conducted by James Levine). As part of an evolution toward new musical styles and techniques in the early twentieth century, this opera, based on the symbolist play by Maurice Maeterlinck, is far removed from the ultrachromaticism of German late Romantic music as well as from the major-minor scale system of Classical functional tonality, its musical language stemming rather from the pentatonic-diatonic modality of Hungarian peasant music. Originating in this source, it is inevitable that the opera should reveal irreconcilable differences from the prevailing supranational German and Italian operas of the nineteenth century in details of phrase, rhythm, and pitch organization as well as in its large-scale formal construction. In its general stylistic technical assumptions, one finds fundamental connections rather with the musical impressionism of Debussy's Pelléas et Mélisande (1893-1902), another revolutionary opera from the same symbolist trilogy of Maeterlinck. Initial rejection of both operas despite some favorable reviews in the case of Pelléas, seems to have been motivated by a genuine lack of public comprehension of their unconventional musical languages.2 An affinity between Bluebeard and Pelléas is partly suggested in their common absorption of pentatonic-diatonic modality into a kind of twelve-tone language, a fusion of which is revealed by Bartók's own statement: ". . . it became clear to me that the old [folk] modes, which had been forgotten in our music, had lost nothing of their vigor. Their employment made new rhythmic combinations possible. This new way of using the diatonic scale brought freedom from the rigid use of the major and minor keys, and eventually led to a new conception of the chromatic scale, every tone of which came to be considered of equal value and could be used freely and independently. "3 From his studies of Debussy's music since 1907, Bartók realized that it was based on the same "pentatonic phrases" that he had found in his own Hungarian folk music, and he attributed this to the influences of folk music from Eastern Europe, particularly Russia.4 Mussorgsky is a major forerunner of this tendency toward assimilation of folk music, and there is evidence that Debussy acquired certain features of folk music primarily from Mussorgsky. Bartók's opera is also closely allied with that of Debussy in its aesthetic, philosophical, and psychological assumptions. With the reaction around the turn of the century against the naturalism of nineteenth-century theater, many authors began to develop a new interest in psychological motivation and a level of consciousness manifested in metaphor, ambiguity, and symbolism. In correspondence with these developments, opera composers had to expand and transform traditional musical means in order to express the more profound psychological conditions of their characters, whose emotions and actions were dominated by the subconscious. In his symbolist plays, Maeterlinck was to transform the internal concept of subconscious motivation into an external one, in which human action is entirely controlled by fate. Both Pelléas and Bluebeard represent significant manifestations of this transformation. Adorno's assessment of musical modernism is particularly relevant to the Bluebeard idiom, in which "the concept of shock is one aspect of the unifying principle of the epoch. It belongs to the fundamental level of all modern music, even of that which stands at extremes . . . . Through such shocks the individual becomes aware of his nothingness . . . ."5 Bartók's opera, limited to a bare minimum of characters, introduces the shock element and a level of reality entirely steeped in metaphor. "Blood," as a symbol of Bluebeard's inner soul, vividly appears in each of his chambers as the seven doors are forced open by Judith, who relentlessly pries into her husband's hidden life. Judith herself represents the "fatalistic" element of relentless time and Bluebeard's inevitable move toward "endless darkness." Perhaps we may also attribute an autobiographical significance to the subject of Bluebeard as an aspect of its symbolism, based on circumstantial as well as internal evidence. At a 1910 reading of the Balázs libretto, which was originally intended for Kodály, it was Bartók who was drawn to this subject. Béla Bartók Jr., Paul Pisk, Felix Galimir, and others who had personal contact with Bartók, have spoken of his aloofness and his need to protect his privacy, an attitude reflected in the character of Bluebeard. It is also striking that of all of Bartók's works, he was to choose Bluebeard for dedication to his wife, Márta Ziegler, whom Bartók divorced in 1923 to marry a younger student, Ditta Pásztory. In the opera, all of Bluebeard's wives are lost as they are inevitably confined to his dungeon. Bartók's new and personal symbolistic musical language is set within a clearly architectural framework in both its overall form as well as local phrasal details, an approach which is in keeping with the composer's understanding of the folk-music structures themselves. The entire opera consists of distinct forms (often based on folk-like quatrain structures that sometimes suggest a rondo type of format) within scenes. Furthermore, much of the melodic and harmonic fabric is generated by means of modal elaboration and transformation, a principle that appears to be derived from the process of thematic variation found in the folk-music sources. From the modal material of the opera, Bartók derives the basic leitmotifs and pitch cells, which are central in generating the musico-dramatic fabric. The basic "Blood" motif, characterized by half-steps, is gradually manifested in the intrusion of this dissonant element into the opening pentatonic folk mode as Judith becomes aware of blood on the castle walls. However, psychological tension in the unbroken musical fabric is created not so much by the manifest details, but by the latent symbolic and metaphorical questions that these details invoke with regard to our own perception of reality. Such questions are explicit in the Prologue: "The curtains of our eyelids are raised. But where is the stag. . . In me? In you?" Psychological development, which is also fundamental to the symbolic meaning of the opera, is realized by means of two inextricably connected and overlapping formal concepts, one sectional, and the other unfolding the dynamic spiritual evolution and transformation of the two characters. Sándor Veress has shown how the large-scale form of the opera is a closed symmetrical construction, an arch-form in three parts: (1) an introduction initially established by a folk-like, brooding, -pentatonic theme and the "Menacing" motif; (2) seven scenes demarcated by Doors I-VII, which peak at the uncovering of Bluebeard's vast domain behind Door V in the contrastingly bright key of C major (the most distant key from the opening ); and (3) a recapitulation of the "Menacing" motif and pentatonic.6 The shape of the sectional arch-form is heightened by the dramatic psychological process. The distinct vocal styles and personalities of the two characters are established at the outset. 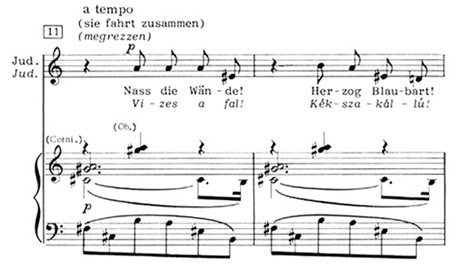 Judith's first vocal entry, a prominent (whole-tone related) wide-ranging figure in a characteristically strong Magyar rhythm, contrasts with Bluebeard's reserved (pentatonic-diatonic) repeated-note line in even durational values. By the time Door V (opening on Bluebeard's vast domain) is reached, this contrast is reversed: the man has progressed from quietness to increasingly intense and passionate utterance, while the woman has moved in decrescendo toward her own extinction. Only when the inevitable occurs and Judith is lost, does Bluebeard become emotionally resigned. The subject of Bluebeard suggests the eternally problematical relation of the two sexes. The relation between the two as depicted in the opera is one that the contemporary feminist movement would deplore, but all the more do we have to understand this relation. There are only two characters, a man and a woman. The Man is the central character. According to Veress,7 Judith symbolizes the passionate and demanding woman who, through her love, is in the man's power, whereas Bluebeard is the reserved man, whose feelings develop slowly and who is reticent to reveal his inner self. Yet, paradoxically, the woman represents the fulfillment of his desires. With the loss of Judith, Bluebeard's last words are "Now it will always be dark." The symbolism of Bluebeard is derived directly from the French symbolism of Debussy's Pelléas. Both the Debussy and Bartók operas belong to the same dramatic trilogy of Maeterlinck and it is in this context that part of the mystery surrounding the woman in Debussy's opera is resolved. We learn from the third drama of the trilogy—Dukas's opera Ariane et Barbe-bleu (1907)—that Mélisande was one of the escaped wives from Bluebeard's dungeon. The woman as "fatalistic" symbol—the siren of destruction—is most evident in the Debussy opera. Musically, the whole-tone scale ("Fate" motif) is the catalyst for transforming diatonic materials ("Human" motifs), the interaction between the two forming the musico-dramatic basis for the entire opera. This interaction of whole-tone and diatonic spheres also underlies the same dramatic symbolism in Bartók's opera. Bluebeard's opening vocal sections are primarily diatonic, Judith's primarily whole-tone, Judith thus "fatalistically" intruding into Bluebeard's inner life. Bartók's opera finds common ground with Debussy's in more than its musico-dramatic symbolistic assumptions. Both operas reveal a similar approach to the relationship between music and language. Bartók's investigations of the old Hungarian folk tunes permitted him to break with the established nineteenth-century tradition of translating Western languages into Hungarian for opera performance, a tradition which had inevitably led to distortions in Hungarian accentuation. Bartók strictly preserved the Hungarian language accents in his musical setting of the Balázs libretto. Furthermore, the archaic syllabic structure is set almost entirely in the old "parlando-rubato" folk style, producing a kind of contemporary "recitative opera" that was pioneered by Debussy. As a primary manifestation of the French reaction to the Wagner Tristan idiom, Pelléas resulted in part from Debussy's interest in the French Baroque, especially Lully's approach to recitative, in which the musical setting was geared to the precise and realistic declamation of the French text. In Pelléas, the recitative style is always sensitive to the rhythm and meaning of the text. Typical single-note repetitions and a constrained vocal range together form a vehicle primarily for the expression of the characters' intentions, while the main melodic phrase in the orchestra (never in the voice) serves to express the musical emotion. In Bluebeard, the Hungarian text—and this is true of the orchestral phrases as well—is appropriately based on eight syllables per line, which is one of the isometric stanzaic patterns that the composer found in the oldest of the Hungarian folk melodies. These music-text relationships in both operas are based on special premises that could only have been established by the liberation of meter and rhythm that was permitted by the disappearance of traditional tonal functions in the early twentieth century. Thus, by means of these new syntactical relations between rhythm and pitch, both composers were able to arrive at new and greatly expanded possibilities for symbolic representation. As in the Debussy opera, the musical fabric of Bluebeard is primarily generated by special "pitch-set" interactions as the basis for symbolic and dramatic expression.8 The opening -pentatonic set, -A-B- -E, a folk-derived diatonic construction without semitones,9 serves as the point of departure for the infusion of semitones as a representation of the emerging symbol of "Blood" as well as for transformation into the whole-tone sphere in connection with Judith's "fatalistic" intrusion into Bluebeard's personal world.10 These two dramatic aspects are closely interconnected as Judith's relentless prying opens the wounds of Bluebeard's soul. In connection with the symbol of "Blood," combinations of semitones move from unobtrusive contexts (that is, as part of larger thematic statements) to being the primary foreground event. The general tendency in the relation of pairs of semitones is toward increasing dissonance (the most dissonant relation of which is the separation of two semitones by a semitone) in association with the main dramatic idea. The excerpt shown in Ex. 1—a prominent foreground statement of a four-note semitonal cell, -A/ -B (i.e., interval-ratio 1:1)11—occurs in the scene of the torture chamber, the first of the seven doors to be opened by Judith. The text at this point reveals that Judith has just noticed blood in Bluebeard's domain: "Deiner Feste Wände bluten!" ("Your castle walls are bleeding!"). (The piano-vocal score published by Universal Edition, 1921, renewed by Boosey and Hawkes, Inc., 1949, is used as the basis of this discussion.) This pair of semi tones ( -A/ -B) , the most dissonant relationship between two semitones, is divorced from any traditional modal construction. Prior to this point, combinations of semitones generally appear as part of larger modal or polymodal thematic material. Example 1. Torture Chamber, Section b1, No. 34f, main "Blood" motif occurrence. The opening -pentatonic theme unfolds in two pairs of four-note phrases, or two larger eight-note pairings of the archaic Hungarian isometric syllabic structure. The "Menacing" motif suddenly appears in overlap with the E- -pentatonic cadence (mm. 18-21), its two phrases of which are also articulated in 2 × 8 "syllables." In addition to its increasing rhythmic agitation by means of the following more fragmented and irregular statements—i.e., the 4 × 4 measures of the opening pentatonic theme are followed by measure groupings of 2 × 2 plus 2 × 1 (extended by 3) and 2 × 1 (extended by 4) that lead to Recitative Part 1—the "Menacing" motif introduces the first intrusion of both chromatic and whole-tone spheres into the opening pentatonic theme as Bluebeard and Judith enter the castle. 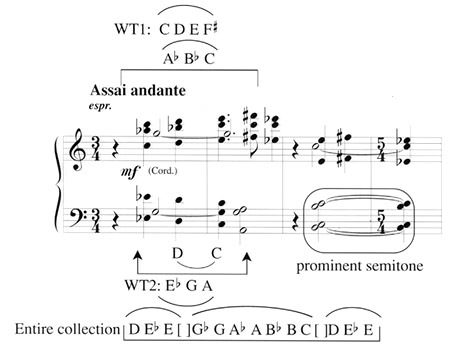 Four of the -pentatonic notes ( -A-B-[ ]-E) are retained in this motif, which expands the pentatonic segment to an exotic nondiatonic mode, -G-A-B-C-[ ]- -E. (This expanded collection suggests a permutation of E harmonic-minor, E- -G-A-B-C- -E, which explicitly unfolds above the held tonic.) Three semitones ( -G, B-C, and -E) are thereby introduced into the original pentatonic formation. In the second statement of the motif (mm. 18-19), the collection is further chromaticized by the addition of , the one -pentatonic note missing from the first statement, so we now get -G-A-B-C- - -E. The latter suggests a permutation of the "bimodal" combination of E harmonic-minor and E melodic-minor, E- -G-A-B-C- - -E, unfolding above the held . Dissonance and tension are thereby introduced by the sudden incorporation of semitones into the opening pentatonic framework. Simultaneously, the "fatalistic" whole-tone sphere is introduced into the melodic and harmonic structure of the "Menacing" motif as the basis of pentatonic transformation. The -pentatonic scale ( -A-B- -E) implies the presence of a segment from each of the two whole-tone collections, the boundary ( -E) belonging to one of these collections, the central three notes (A-B- ) to the other. In the linear bass accompaniment of the "Menacing" motif (Ex. 2), the cadential pentatonic dyad, E- , is expanded to a four-note whole-tone tetrachord, C-D-E- , a segment (C-[ ]-E- ) of which serves as the basic chord of the first phrase (mm. 16-17) as well as the embellished frame of the upper melodic line of the motif. The melodic cadence of the second phrase introduces a gapped segment (A-[ ]- - ) from the other whole-tone scale, a transposition of the initial gapped cell (C-[ ]-E- ) which produces a chromatic conflict with the primary whole-tone collection in the bass.12 The priority of the latter is re-established by the initial chord ( -C-D) of the next statement (No. 1). Example 2. Prologue, m. 16 through No. 1, "Menacing" motif, whole-tone expansion of cadential -pentatonic dyad, E- . Bluebeard's first recitative begins with a textual scheme of 4 + 12 syllables, one of the few irregular groupings of the 8 + 8 isometric structure. This reinterpretation permits a special phrasal elision to occur between the final statement of the "Menacing" motif (No. 2, mm. 1-5) and the overlapping initial entry of the vocal part. Specifically, the first two orchestral motivic fragments of 4 + 4 articulations are melodically extended by four more notes, so the four syllables of the overlapping vocal entry complete the latter as a 4 + 4 rhythmic construction. 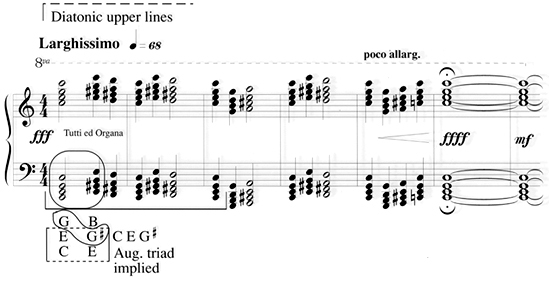 This technique produces continuity between the orchestral introduction and the first words of the opera, while maintaining an allusion to the isometric (8 + 8) folk structure. 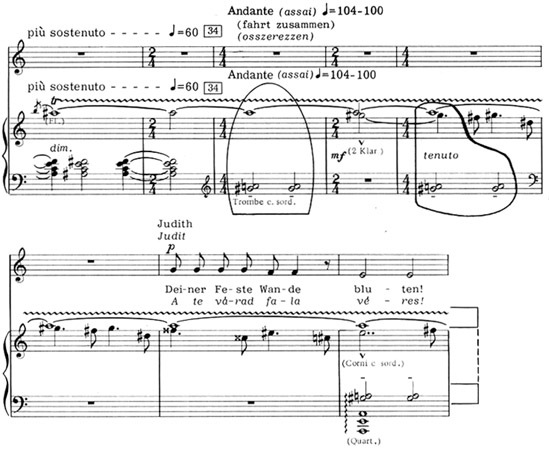 At the same time, this cadential four-note orchestral extension outlines a segment ( -A-[ ]- -E) of the original pentatonic collection to establish the pentatonic significance of Bluebeard's octave at his words, "Wir sind am Ziele" ("Here ends our journey"). In his ensuing phrase, -pentatonic is transposed to D-pentatonic, a special transpositional relationship between these two pentatonic collections ( -A-B- -E and D-F-G-A-C) implying the presence of certain fundamental pitch-set criteria for further intrusion of the whole-tone ("fatalistic") sphere and Judith's first statement. Specifically, the boundary whole-tone ( -E) of the original -pentatonic collection is replaced by the new whole-tone boundary (D-C) of Bluebeard's D-pentatonic statement, both boundaries having jointly unfolded in the bass accompaniment to the "Menacing" motif (mm. 16-21) as a whole-tone tetrachordal extension and transformation (C-D-E- ) of the -pentatonic sphere. Thus, this primary whole-tone tetrachordal cell, which is also basic to the chordal structure of the motif, serves as a link between the two pentatonic transpositions to establish one of the basic musical premises for the "fatalistic" intrusion into Bluebeard's world. While Bluebeard's quiet D-pentatonic line is diatonically elaborated by B and E (No. 2, mm. 10-14) to form the larger D-Dorian mode (D-E-F-G-A-B-C), Judith responds to his questioning with a contrasting rhythmic and wide-ranging line at her words "Ja, ich folge, Herzog Blaubart" ("Lead me, loved one, I will follow"), based on further infusion of the whole-tone sphere into the -pentatonic collection. Her vocal statement (Ex. 3) outlines a descending segment (F- - -A) belonging to the secondary whole-tone scale, the cadential revealing the presence of the -pentatonic triad (in enharmonic spelling, -A- ), so the basic -pentatonic collection is partially transformed into a hybrid whole-tone/pentatonic formation, -A- - -F (i.e., -A- - -F) at Judith's first utterance. Thus, while the respective boundary whole-steps ( -E and C-D) from the -and D-pentatonic collections were jointly manifested as a segment (C-D/E- ) from the primary whole-tone collection, Judith's whole-tone segment (especially the augmented-triad A- -F) from the secondary whole-tone collection is an enharmonic manifestation of the internal whole-tone segments (A-[ ]- and F-[ ]-A) of the - and D-pentatonic scales, respectively. Example 3. Judith's opening theme, No. 3, further infusion of whole-tone sphere into -pentatonic collection. The fusion of whole-tone and pentatonic spheres in Judith's line also has wider ramifications in connection with the gradually emerging symbol of "Blood." Her highest note (F), which belongs to the whole-tone segment (F- -A), and her lowest note ( ), which belongs to the pentatonic segment ( -A- ), together produce a half-step boundary (F- ), one of several prominent half-steps to have emerged in these passages thus far. The first of these prominent half-steps, D- , occurred as a linear disruption of the whole-tone bass line, C-D-E- (at No. 1, mm. 2-3), the second and third, -F and -D, as the bass of the brief orchestral interlude (No. 2, mm. 6-7) connecting Bluebeard's first two phrases. The connection between the semitones that foreshadow the chromatic "Blood" motif and the whole-tone "fatalistic" symbol also occurs on a more complex level in the material surrounding Judith's statement. The held orchestral chord expands Judith's vocal whole-tone content to five notes (A-B- - -F) by the addition of a new note, B, while the cadential pentatonic vocal note ( ) from the primary whole-tone scale is expanded to a larger whole-tone segment ( -C) by the addition of the orchestral neighbor note, C. This chromatic mixture of basic components from both whole-tone collections (C- , in enharmonic spelling, C- , from tetrachord C-D-E- , i.e., boundary elements of the basic - and D-pentatonic formations, and A-B- - -F from Judith's statement) is further elaborated in the next interlude (Ex. 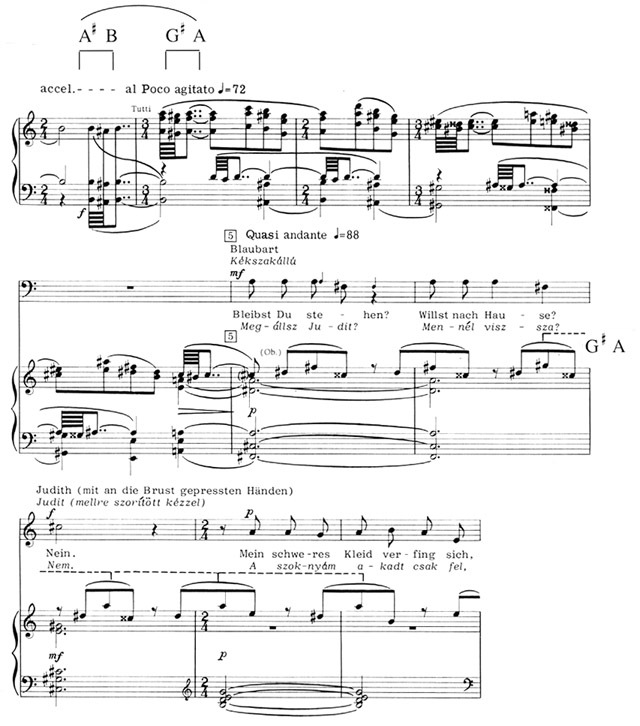 4), which connects Judith's line and Bluebeard's next statement at the beginning of Recitative Part 2 (No. 3, m. 6). The two parallel ascending lines (C-D-E- and - -C) in the first four articulations of this interlude together outline the complete primary whole-tone collection, while the held notes (G-A) and boundary notes ( -A) of the descending line imply the presence of a gapped whole-tone cell ( -[ ]-G-A) from the secondary whole-tone collection. 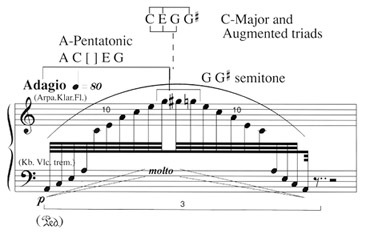 The entire chromatic content that results from these combined whole-tone segments, together with the next prominent half-step (B-C) in the bass, reveals a systematic structural projection and chromatic elaboration of the basic whole-tone tetrachord, C-D-E- , i.e., the entire content, D- -E-[ ]- -G- -A- -B-C-[ ]-D- -E, contains two gaps, one between E and , the other between C and D. Thus, the musical premises underlying the dramatic connection between Judith as an unrelenting "fatalistic" force (whole-tone sphere) and the anticipation of the "Blood" of Bluebeard's soul (chromatic sphere) are firmly established at the entry of the two characters into the castle. Example 4. Brief orchestral interlude, No. 3, mm. 3-6, chromatic mixture of both whole-tone collections. Example 5. Bluebeard's vocal line of Recitative Part 2, No. 3, mm. 6ff, hybrid diatonic-octatonic formation based on foreground occurrence of earlier half-steps at interval-ratio 1:2 ( -F/ -D/C-B). Henceforth, in anticipation of blood, the primary transpositional level of two semitones at interval-ratio 1:1 ( -A/ -B) emerges with increasing prominence from the modal thematic material into a foreground event. At the return of the "Menacing" motif (No. 4, mm. 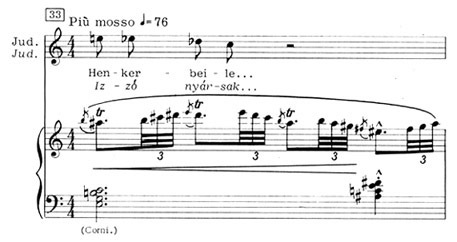 5-6), both of these semitones appear for the first time as basic details within the larger thematic statement, introducing Bluebeard's question: "Bleibst Du stehen? Willst nach Hause?" ("Are you anxious? Do you linger?") (Ex. 6). Example 6. Return of "Menacing motif, No. 4, mm. 5ff, first foreground emergence of primary transpositional level of "Blood" motif ( -A/ -B). At this point (No. 5, mm. 2-5, flutes and oboes), one of these semitones ( -A) appears as the upper boundary of the successive eighth-note figures. At Judith's comment (No. 10, mm. 8-9), "Deine Feste ist so dunkel!" ("Darkness rules within your castle"), the pitch content of the accompanying pentatonic collection ( - - - - ) is disrupted by a single dissonant note (A) in the voice, implying the presence of a partial statement of the basic 1:1 cell, -A/ -[ ]. At Judith's first allusion to blood (No. 11), "Naß die Wände!" ("Oozing walls"), one of these semitones ( -A) appears as a primary foreground event in the flutes, oboes, and horns (Ex. 7). Example 7. Judith's first allusion to blood, No. 11. one semitone ( -A) of "Blood" motif as primary foreground event in flutes, oboes, and horns. The components of this semitonal cell appear with increasing prominence in correspondence with the growing awareness of blood.15 As the opening of the first door (Torture Chamber; No. 30f.) produces a blood-red gap in the wall, the trilled semitone -B appears as a dissonant element against the partially diatonic figurations. This semitone (at No. 33) is briefly diatonicized as part of the scale figures, -B- - -E, and its inversion, B- - - - (Ex. 8), the basic -B forming an interval ratio of 1:4 with each of the other two diatonic semitones ( -B/ -E and - / -B). Then, at the main dramatic focal point of the symbol of "Blood," (No. 34; see Ex. 1, above), semitone -B is dissociated from the latter diatonic context and joined with the other basic semitone, -A, to form the dissonant 1:1 cell, -A/ -B. Thus, the derivation of an abstract chromatic intervallic cell from traditional modal formations contributes to the expression, direction, and integration of the drama. Example 8. Torture Chamber, No. 33f, trilled semitone -B of "Blood" motif in diatonic interval-ratio 1:4 with two other boundary semitones ( -B/ -E and - / -B) in ascending and descending scalar figure. The large-scale development of the contrasting personalities of the two characters is partly reflected in the formal proportions of their paired statements. Judith's dynamic, though brief, interjectory responses (at No. 3 and No. 4, mm. 3-4) within the opening pair of recitatives shifts in Part 2 (No. 6) of the second pair of recitatives to an extended and uninterrupted assertion of her will to follow her husband. In the three ensuing monologues (Nos. 9-19, m. 4), Judith's vocal part prevails, and her positive attitude is expressed by her desire to let light into the castle. The sectional form of the first door scene (Torture Chamber), a folk-like quatrain musical structure outlining a larger binary form—introduction a1 b1/a2 b2 introduction—serves to demarcate the polarized attitudes of the two characters, one positive, the other negative. In the first half, the dialogue of both characters refers to elements of torture, fear, and blood, the main occurrence of the "Blood" motif articulated by the music of Section b1 (No. 34). In Section a2 (No. 36), Judith's words, "Nein! Mir bangt nicht. Ein Schimmer dort, sieh sich's lichten!" ("No, I fear not. The light is come, here the light is"), are now contrasted by Bluebeard's statement, "Rote Quelle, blutge Quelle" ("Blood it is that streams before us"). This polarity is further developed in b2 as Judith speaks of light, love, and the desire to probe, while Bluebeard refers to hiding, trembling, and danger. The larger binary musical form of this scene is, therefore, in general correspondence with the textual references to blood and fear in a1 and b1 vs. light and courage in a2 and b2. In connection with their respective attitudes, the two characters further develop their corresponding pitch-set spheres (diatonic and whole-tone) that have been established from the very beginning. As the orchestra gradually realizes the chromatic "Blood" motif (see Ex. 1, above), Bluebeard's interjections establish his pentatonic-diatonic association in two perfect fourths, C-G and E-B, which are harmonically projected as an inverted C-major-seventh chord (E-G-B-C) as well. At his statement, "Meine Folterkammer, Judith" ("Now you see my torture chamber"), the perfect-fourth segment, D-G-C, suggests the frame of his original D-pentatonic recitative (D-F-G-A-C), the held C-major-seventh chord providing the two notes (E and B) that originally expanded this pentatonic collection to the larger D Dorian mode (see No. 2, mm. 7ff., vocal line). The pentatonic whole-step boundary, D-C, which originally served as a link with the whole-tone sphere, is brought into registral and temporal proximity at this statement, analogous to its original cadential function (see No. 2, m. 9). This pentatonic whole-step is then absorbed into the whole-tone sphere, as Judith unfolds her first whole-tone statement of the passage. Her first four pitches, C- - - , form the inversion of the original whole-tone tetrachord, C-D-E- , which accompanied the "Menacing" motif (mm. 16-19). At this point, the whole-tone tetrachord is linearly extended by a transposition (E-C- ) of her original augmented triad (F- -A), this extension having two important consequences: it completes a linear statement of the whole-tone scale beginning with Bluebeard's preceding D-C, and it produces a shift from Judith's original secondary whole-tone collection to the primary one containing the whole-steps (C-D and E- ) that bounded the - and D-pentatonic collections associated with the castle and Bluebeard. This transposition (E-C- ) of her original augmented triad also permits a more complete transformation of the -pentatonic collection into the whole-tone sphere. Her original line, F- -A- (in enharmonic spelling, F- -A- ) represented a whole-tone extension of, or deviation from, the -pentatonic structure, whereas in the present passage, the transposition (E-C- ) draws the cadential (i.e., ) into the same whole-tone scale. It is striking that at her interjections on "Schrecklich! Schrecklich!" ("Dreadful, dreadful"), which directly precede the main statement of the "Blood" motif, what appears is the tritone transposition ( -[ ]- -C) of the gapped primary whole-tone cell (C-[ ]-E- ) that served as the harmonic frame for the first statement of the "Menacing" motif. The main harmonic construction at this point is the "French-sixth" (whole-tone) chord, -C-E- , which represents a fusion of both cell transpositions (C-E- and - -C). This passage also represents a focal point for the fusion of diatonic (Bluebeard), whole-tone (Judith as "fatalistic" element), and chromatic ("Blood") spheres. While Judith's vocal line produces a whole-tone transformation of both D-pentatonic (represented by Bluebeard's perfect fourths, D-G-C) and -pentatonic (represented by Judith's cadential figure ending on ), the orchestral figurations produce systematic semitonal intrusions into Judith's whole-tone phrase. The two alternating diatonic orchestral figures, -B- - -E, and its inversion, B- - - - , both contain axial whole-tone trichords, B- - and - - , respectively. While the first produces a chromatic conflict with Judith's whole-tone vocal line, the second, - - (in enharmonic spelling, - - ), duplicates Judith's axial whole-tone trichord. At the same time, the boundary notes, B- , of the second diatonic segment (B- - - - ) map chromatically into Judith's whole-tone line, C-[B]- - - -[ ]-E, precisely between the two whole-steps (C- and -E) that are also vertically projected to form the reiterated "French-sixth" chord (in enharmonic spelling, -C/E- ). Such half-step intrusions into Judith's whole-tone sphere are anticipated in her initial vocal statements (No. 32f. ), where her whole-tone-related boundary, E-C (No. 33), is adjoined by half-steps to produce an octatonic, or interval-ratio 1:2 segment, E- / -C.
In the ensuing scenes, a gradual reversal of personalities occurs, as Judith becomes increasingly aware of Bluebeard's power (Door II: Armory Chamber) and riches (Door III: Treasure Chamber). At the same time, Bluebeard becomes somewhat less resistant to Judith's demands to open the doors, as he acknowledges the inevitable, "Fürchte nichts mehr, 's ist entschieden" ("Put fear aside, fate has willed it")16 (No. 53, mm. 7ff.). Approaching Door IV (Garden), Judith shows signs of increasing alarm. Bluebeard now refers to light, "öffne schell die vierte Türe. Es werd' helle, Öffne, Öffne ("Let the fourth door now be opened! Let the light in! Open! Open! "), a mood contrasted by Judith's words, "Birgt dein Felsen Wunderblumen?" ("Hedged by gloominess, a garden!"). At the opening of Door V (Bluebeard's Domain), a complete reversal and the most extreme contrast of personalities is reached, as Judith realizes the endlessness and brilliance of Bluebeard's world. The musico-dramatic polarity between the two characters at this highpoint is reflected on various structural levels. The symmetrical quatrain structure of the Hungarian folk sources serves as the point of departure for a more complex structural development, the principle of structural extension of which also seems to be derived from the idea of thematic variants characteristic of the folk-music sources. The overall construction of the scene, an asymmetrical or extended binary form (Ex. 9), is initiated by Section A1, a quatrain structure (a1 a2 a3 a4) each subsection of which is further broken down into four octosyllabic phrases. In Subsection a1 (Nos. 75-76), Bluebeard's personality is immediately established as predominant, his "fortissimo, quasi parlando" line occupying three of the four phrases, while Judith's part is reduced to a single "piano, senza espressione" line without accompaniment. Furthermore, Bluebeard's text now alludes to light, "in der Fernen blaue Berge. . . dir die Sonne, Mond und Sterne" ("blue beyond the park, the mountains. . . Make the moon and stars your servants"), while Judith refers to the redness of blood. 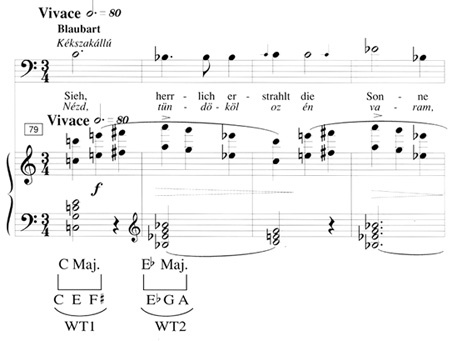 While Bluebeard's part is still characteristically pentatonic—the Hungarian folk-music form (A-C-D-E-G) is permuted in this case to C-D-E-G-A—Judith's part is also absorbed into the pentatonic sphere ( - - -[ ]- ), a tritone away from that of Bluebeard. Strikingly, the complementary relationship of their pentatonic collections implies the presence of a chromatic continuum (C- -D- -E-[ ]- -G- -A-[ ]-[ ]) containing gaps that mark the two basic tonalities (C and , i.e., ) of the opera. This locally reflects the background-level polarity between the -pentatonic tonality of the Prologue and the C-major tonality of this scene, a relation which was first locally reflected in the whole-tone cell, C-D-E- , in the harmonic structure of the "Menacing" motif (see mm. 16-19), and at Bluebeard's and Judith's final iterations just prior to the first explicit appearance of the "Blood" motif (No. 34). Example 9. Bluebeard's Domain, No. 74, mm. 19ff, overall extended binary form of the scene, projection of quatrain folksong structure into several formal levels with increasing irregularity. While Judith has moved from whole-tone to pentatonic, the reversal of pitch-set associations between the two characters is also implicit in the opening chordal accompaniment, where the whole-tone sphere conversely begins to intrude into the voice leading of the triadic progressions accompanying Bluebeard's opening three C-based pentatonic phrases (Ex. 10). Example 10. Bluebeard's Domain, No. 74, m. 19, orchestral introduction, based on intrusion of whole-tone sphere into lower voice leading of modally mixed parallel major triads. The key of C major is established by the linear content and shape of the outer voices as well as by the prominent metric placement of the tonic triad, while the overall triadic progression itself has little to do with traditional tonal functions. Instead, the parallel harmonic motion produces a series of major triads resulting in modal mixture and the intrusion of tones foreign to the basic key of C major. The content of the two upper lines of these triads is exclusively "white-key" diatonic, the two lower lines of the first seven chords exclusively unfolding five of the six notes of the primary whole-tone scale, C-D-E- - . The latter shifts in the two lower lines of the next two chords (G-B-D and A- -E) to a four-note segment (G-A-B- ) of the secondary whole-tone scale. The relationship between the first two triads (C-E-G and E- -B) of this harmonic progression is most significant in connection with both Bluebeard's transformation from diatonic to whole-tone spheres and the intrusion of the semitonal "Blood" symbol. These two chords together (C-E-G- -B) imply the presence of the C-augmented triad (C-E- ), a whole-tone-related construction originally associated with Judith (see No. 3, above). By the end of the scene (No. 89, mm. 20-21), Bluebeard takes over Judith's opening whole-tone/pentatonic theme, the transposition up by a major third (to A-F- - ), at his words, "Judith, Judith, laß geschlossen!" ("Judith! Judith! Leave its secret"), permitting Judith's original augmented triad (F- -A) to remain unchanged. 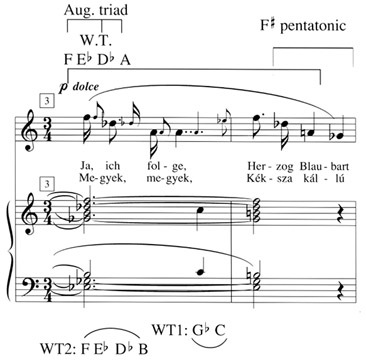 The difference between the explicit tonic triad (C-E-G) and the implied augmented triad (C-E- ) in the opening chords of this scene is the half step between their fifth degrees, G and , an interval that becomes increasingly prominent with the intrusion of blood into Bluebeard's domain. These implied pitch-set interactions (diatonic, whole-tone, and chromatic), which are somewhat obscure and tenuous in this chord progression, are more explicitly manifested at the opening of Door VI (Lake of Tears) (No. 91), where the throbbing A-pentatonic arpeggiation has an added at its apex (A-C-[ ]-E-G- ) to reveal a more exclusive foreground connection between this note ( ) and the C-major triad (Ex. 11). Furthermore, in these arpeggiations forms a half-step relation not only with the adjacent fifth degree (G) of the C-major triad, but also with the lowest note (A) to imply the presence of an interval-ratio 1:1 cell, G- -A-[ ]; an isolated semitone, E- , punctuates this first set of arpeggiations. Example 11. Lake of Tears, No. 91, fusion of diatonic, whole-tone, and chromatic in arpeggiations. This conflict between the diatonic (C-E-G) and whole-tone (implied C-E- ) spheres is also projected into the background-level tonal scheme of Section A1 of Bluebeard's Domain. While Subsection a1 establishes the priority of C Major, the first three phrases of Subsection a2 (No. 76, mm. 1-14) move from F major to G major at the cadence. Following the fourth phrase, which again reveals Judith's quiet vocal tone in the contrasting "black-key" pentatonic area, G major moves up a half step to major at the opening of Subsection a3 (No. 77). The significance of these two keys, G and (i.e., as tonal projections of G and of the opening C-major and E-major triads), is confirmed by the shift from major to E major for the remainder of a3 (to No. 78). The local structure of 3 + 1 phrases of Subsections a1 and a2 and 4 + 1 phrases of a3—these proportions directly underlie the contrast between Bluebeard's power and Judith's timidity—is paralleled in the larger construction of Section A1, as Subsection a4 (No. 78, mm. 3ff) shifts to a dissonant, half-step bounded chord (F- -C- ) in support of Judith's first explicit reference to blood in this scene. Furthermore, basic tritone C- emerges as a local event in this chord, while Judith's vocal line is a pentatonic transformation of her original whole-tone/pentatonic theme (see No. 3, above). Section A2 (No. 79f.) is a focal point for the most explicit manifestations of the basic pitch-set interactions of the opera. Subsection a1 recapitulates the main key of C major, the chord progression alternating two triads (C major and major) as a telescoping of Bluebeard's initial C-based pentatonic tonality and Judith's -pentatonic tonality from the first and fourth phrases of this scene. (This tonal juxtaposition may perhaps be viewed as an adumbration of Door VII, Former Wives, where Judith's prying seals her fate—the Wives' scene is in C minor, the tonic chord of which fuses components of both the C and tonalities.) Bluebeard's vocal line (No. 79) also fuses elements from C and , the "black keys" ( and ) intruding for the first time into his "white-key" C-based pentatonic frame in anticipation of the inevitable loss of Judith (Ex. 12). Example 12. Bluebeard's Domain, Section A2, No. 79, explicit manifestation of original gapped whole-tone cell (symbol of "Fate") in two transpositions from both whole-tone collections, and intrusion of "black keys" into Bluebeard's "white-key" C-based pentatonic frame. Against Bluebeard's vocal line, the original gapped whole-tone cell, C-E- (symbol of "Fate"), which had appeared as the basic harmonic structure of the "Menacing" motif (mm. 16ff. ), i.e., the first whole-tone intrusion into the opening -pentatonic sphere, now appears in its most prominent manifestation. At this point, this primary whole-tone cell (C-E- ) forms an ostinato in alternation with its transposition, -G-A, from the secondary whole-tone collection. Both transpositions had already appeared in the brief interlude following Judith's very first statement (see Ex. 4, above), where they were obscurely embedded in the simultaneously ascending and descending instrumental lines. Ultimately, these two cell transpositions represent a whole-tone transformation of Bluebeard's "white-key" pentatonic collection (C-E-G-A, or in Hungarian pentatonic form, A-C-[ ]-E-G) that opened this scene, the addition of the two "black-keys" ( and ) in this ostinato transforming these pentatonic "white keys" into the whole-tone sphere (C-E- and -G-A). Both cells together form a six-note octatonic segment (C-[ ]- -E- -G-A-[ ]), the from Bluebeard's vocal line expanding the latter to seven notes (C-[ ]- -E- -G-A- ), so we get a more dissonant fusion of whole- and half-steps in the interval ratio of 1:2 as well. The large-scale form of the scene further reflects the proportions of the quatrain phrase structure of the subsections as well as the larger quatrain sectional structure within A1 (see Ex. 9, above). Section A2 also unfolds several subsections analagous to A1, but in place of an "expected" a4, we get a greatly expanded subsection which because of its extremely contrasting and developmental character, may more appropriately be referred to as Section B (No. 85). 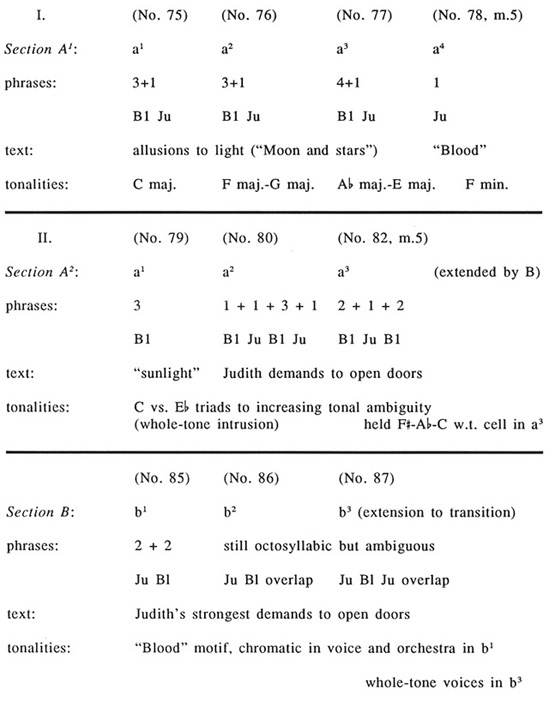 As a macroscopic structural reflection of Judith's reference to blood in the fourth phrase of the first Subsection of A1, Section B is initiated by the most intensive unfolding of the chromatic "Blood" motif, which contrasts with the whole-tone and diatonic interactions of the three Subsections of A2. In anticipation of the "Blood" motif, the tritone transposition ( - -[ ]-C) of the basic whole-tone ("fatalistic") cell intrudes as a held chord against Bluebeard's diatonic line in Subsection a3 (No. 82, mm. 11ff.). Against this primary whole-tone chord, Judith briefly reiterates her original whole-tone theme in a contour inversion initiated by the augmented triad from the secondary whole-tone scale, A- -F- (No. 83, mm. 5-8), as she demands that the other doors be opened. Both whole-tone segments ( - -C and A- -F) together produce three semitones, F- , -A, and C- . Toward the end of Section B (No. 87), both characters unfold segments from the two whole-tone scales, respectively, Bluebeard with a descending whole-tone tetrachord, D-C- - , at the words, "Ford're das nicht, ford're das nicht, Judith! Judith!" ("Ask me no more! No, I beg you, Judith, Judith! "), Judith with her original whole-tone/pentatonic theme modified now to form an exclusively whole-tone segment, A-G- -B. The final transformation occurs at the transition to Door VI (No. 90, mm. 11-12), as Bluebeard takes over Judith's original hybrid whole-tone/pentatonic theme a major-third higher, A-F- - . The opera ends with a return to the "Menacing" motif and a segment of Bluebeard's original D-pentatonic recitative, in enharmonic spelling, -A-G-D (Nos. 138-139), the adjacency of the first three notes ( -A-G) echoing the whole-tone collection of Judith's "fatalistic" theme. Bluebeard's last words, "ewig, ewig" ("Endless darkness"), bring a brief return to tritone -C of the original whole-tone scale, this tritone dissolving as the note C is replaced by the final pentatonic at the incomplete cadence of the basic -pentatonic theme. Thus, as the intended inception of a new and genuinely Hungarian operatic tradition, Bartók consciously fused in Bluebeard the fundamental musical elements of Eastern-European folk music with Debussy's impressionistic techniques, both of these historical sources of which had begun to challenge the hegemony of German late-Romantic music in the late nineteenth and early twentieth centuries. Finding common ground in their symbolistic assumptions, both the Debussy and Bartók operas are exemplars of the trend in the first decades of the century toward a new means of musical expression and integration of the entire musical fabric. Due to the free use of the folk modes and the disappearance of the triad as the fundamental harmonic premise, which led to the dissolution of the hierarchical pitch relations inherent in the traditional dominant-tonic progressions, greater emphasis had to be placed on the intervallic properties of both the harmonic and melodic constructions as a means of establishing local and large-scale structural coherence. We may infer from the foregoing study that the primary integrative means for such a musical context, based on the equalization of the elements of the chromatic continuum, are derived from the interaction of discrete pitch-sets. The specific intervallic constructions of such sets (especially pentatonic/diatonic and whole-tone) are exploited by both Debussy and Bartók in reflection of the dramatic relations based on the polarity, interaction, and transformation between human and fatalistic realms. It is in this radical transformation of both the musical language and the aesthetics, in which states of mind are explored in symbolic contexts that go below those levels of reality characteristic of nineteenth-century lyric theater, that we find the modernistic sources of these operas. 1Certain portions of the historical discussions in this article are derived from Elliott Antokoletz and George Perle, "Erwartung and Bluebeard," program note in Stagebill, for the performance by the New York Metropolitan Opera, January 16, 1989. 2At the same time, Jann Pasler has pointed out, in her article, "Pelléas and Power: Forces Behind the Reception of Debussy's Opera," Nineteenth Century Music 10 (1987), 244, that "the controversy associated with Debussy's opera extended far beyond that caused by the first performances, and that it was fueled more by the clash of values held by the various groups in the opera's first audiences than by the intrinsic nature of the work itself." Through her study of the varied critical opinions, Pasler points to the divergent cultural and social forces that motivated public attitudes. 3Béla Bartók Essays, ed. Benjamin Suchoff (New York: St. Martin's Press, 1976), 410. The original publication appeared in "Selbstbiographie," Musikblätter des Anbruch (Vienna) 3/5 (March, 1921), 89. 5Theodor W. Adorno, Philosophy of Modern Music, trans. Anne G. Mitchell and Wesley V. Blomster (New York: The Seabury Press, 1973), 155-56. 6Sándor Veress, "Bluebeard's Castle," Béla Bartók: A Memorial Review (New York: Boosey and Hawkes, 1950), 53. 8These interactions are almost exclusively based on diatonic, whole-tone, and chromatic pitch-sets and their derivative subcollections or "intervallic cells." 9In the Hungarian folk-music sources, the pentatonic scale always occurs in its (symmetrical) minor-modal form, as opposed to those permutations found in Russian and Chinese sources. 10Part of the following discussion of the relation between the semitonal "Blood" motif and the diatonic sphere is derived from Elliott Antokoletz, The Music of Béla Bartók: A Study of Tonality and Progression in Twentieth-Century Music (Berkeley and Los Angeles: University of California Press, 1984), 89-93. 11The first number refers to the two semitones that form the primary interval couple, -A and -B, the second number to the interval of their adjacency, in this case, semitone A/ ). 12We will refer to the initial whole-tone collection, C-D-E- - - (or its enharmonic form, C-D-E- - - ), as "primary," the other whole-tone collection, - -F-G-A-B (or its enharmonic form, - -F-G-A-B), as "secondary." 13"Octatonic" refers to an eight-note symmetrical scale alternating whole- and half- or half- and whole-steps. 14See Béla Bartók, Rumanian Folk Music, Vol. 4, ed. Benjamin Suchoff, trans. E.C. Teodorescu et al. (The Hague: Martinus Nijhoff, 1975), 19. Also see Bartók, The Hungarian Folk Song, ed. Benjamin Suchoff, trans. M.D. Calvocoressi (Albany: State University of New York Press, 1981), 18. 15For an outline of these occurrences, see Veress, n. 6, above, pp. 45-49. Elliott Antokoletz, Professor of Musicology at the University of Texas at Austin, has held two Endowed Professorships. His theoretical contributions earned him the Béla Bartók Memorial Plaque and Diploma from the Hungarian Government in 1981. He received the Ph.D. Alumni Award from the Graduate Center of the City University of New York in 1987. He has lectured throughout Europe and the United States, and has given lectures in Australia and Latin America. He is the author of eight books and contributing editor of several others as well as the International Journal of Musicology. Antokoletz majored in violin at the Juilliard School of Music (BS 1964) and Musicology at the City University of New York, where he received his Ph.D. in 1975. He taught theory at Queens College, where he was a member of the Faculty String Quartet and was also concertmaster of the New Repertory Ensemble of New York.